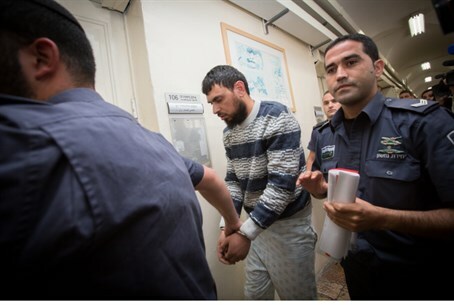 Israel Police have named the main suspect in a car attack which killed Shalom Yohai Sherki and seriously injured his date, Shira Klein, as 37-year-old Khaled Kutina. The terrorist's pregnant wife claimed in interviews with Palestinian Arab media on Friday that her husband is not at all interested in politics and news, so the incident was not a terror attack but "a car accident caused by the weather." Kutina worked as a cleaner in a mosque near Shuafat neighborhood and suffered a medical problem, Arab media claims. Kutina's lawyer, attorney, Nasser Mazziz denied the allegations in his client's name. "My client denies any involvement in illegal activity, except in a car accident that was reasonable under the conditions today," he said. It was raining hard and the respondent believes that ultimately the court will release him." On Thursday night, police announced their suspicions that the "car accident" was indeed a terror attack, with evidence from the scene including the way the car struck the bus stop where the two were waiting strengthening that assessment. Thousands attended Sherki's funeral in Jerusalem on Thursday, which was attended by the Chief Rabbis of Israel and Jerusalem Mayor Nir Barkat. He was the son of the popular Rabbi Uri Sherki, a prominent religious-Zionist scholar, as well as a brother of Channel Two journalist Yair Sherki. Friends and teachers at Sherki's former school in Bet El - where he worked as a youth counselor following his IDF service - expressed their shock and sorrow at the loss of "such a special person."